If you are entering lines in a table, you can drag and drop data from the browse window into the line. 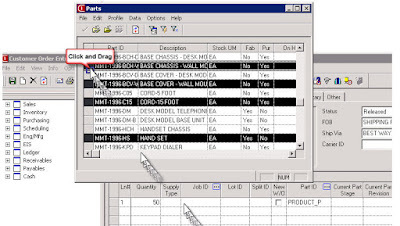 For example, if you are entering lines in Customer Order Entry and you have the Part Browse window open, you can drag one or more parts from the browse window onto the line item table. VISUAL adds the relevant information to the lines. You can also select multiple lines by clicking on one line and dragging the cursor through other rows or by holding CTRL and clicking different lines. 1) Click the normal “Browse” button to bring up the list of Parts. 2) Scroll through the list or apply a search filter to get to the parts you need to add. 3) Select one or more rows by clicking the dark box at the front of the line. a. To select various lines, hold the CTRL key on your keyboard as you click. 4) When ready, LEFT-CLICK and HOLD for a second on one of the dark boxes in front of a selected line. 5) The mouse pointer will change to include a small box. 6) Keep holding the left mouse button. 7) Drag the mouse pointer to the line item table. 8) Release the mouse button anywhere in the line item table. 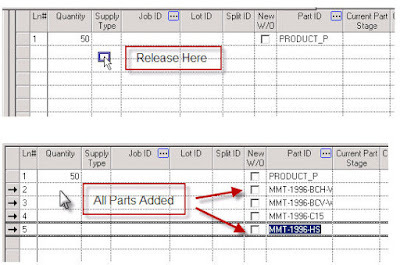 9) The Parts selected will all be added as new line items. 10) Update Qty, Price, etc. as usual.